Seventy years ago, with Adolf Hitler’s crumbled Third Reich still fresh in their memories and Joseph Stalin’s Soviet Union having a choke hold on their future, Berlin’s children were starving. With the Nazi surrender in 1945, the Allies divided the defeated Germany. The French, British and Americans took the western half of the nation spreading the ideals of democracy, while the Communist Russians occupied the eastern half of Germany. Berlin itself was divided into sectors between the allies, but was completely surrounded by the Soviet-controlled sector of Germany. More than three years after World War II ended, Russian forces blockaded the Allied-controlled areas of Berlin on June 24, 1948, shutting off access to food, coal and medicine to two million German citizens. Berlin became the first front line of The Cold War and the nine-month old U.S. Air Force was charged with keeping Berliners alive while keeping the Cold War from turning hot. 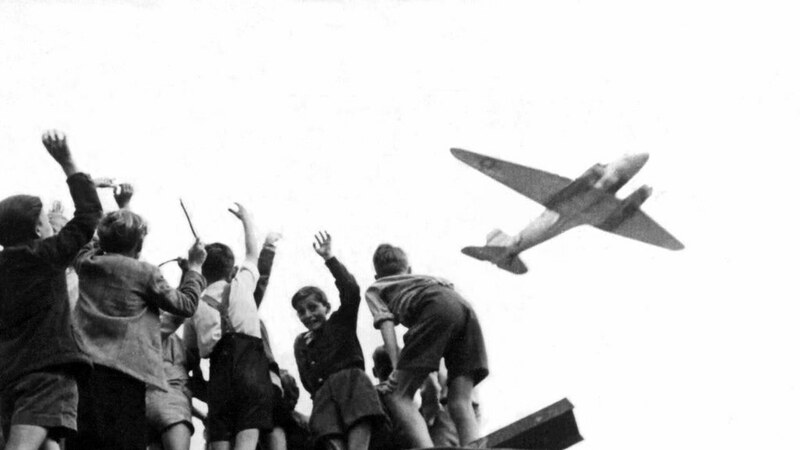 German children in West Berlin wave to a U.S. Air Force transport aircraft as it comes in to land at Templehof Airport during "Operation Vittles", better known as the Berlin Airlift, in 1948. In June of 1948 the Soviet Union closed all land crossings to Berlin across the Soviet sector of Germany leaving West Berlin without food and supplies. The USAF and British Royal Air Force aircraft flew around the clock throughout the year and into 1949 until the Soviets reopened land routes on May 12. 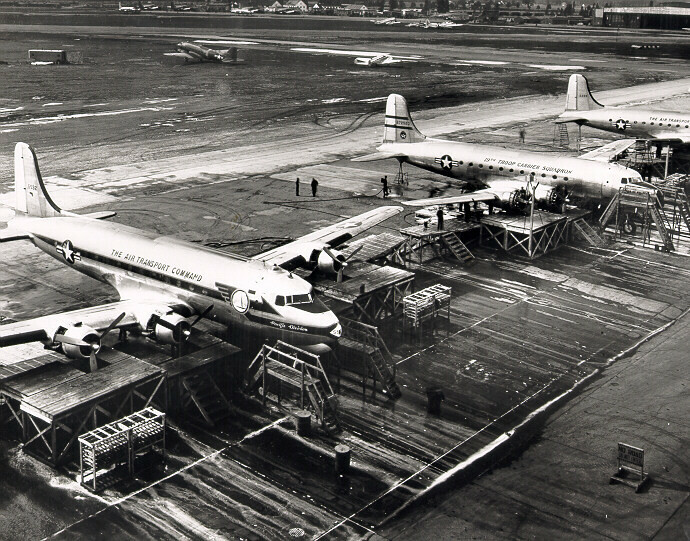 The Berlin Airlift began two days later, with U.S. Air Force C-47 Skytrains and C-54 Skymasters delivering milk, flour and medicine to West Berlin. Throughout the duration of the blockade, U.S. and British aircraft delivered more than 2.3 million tons of supplies. 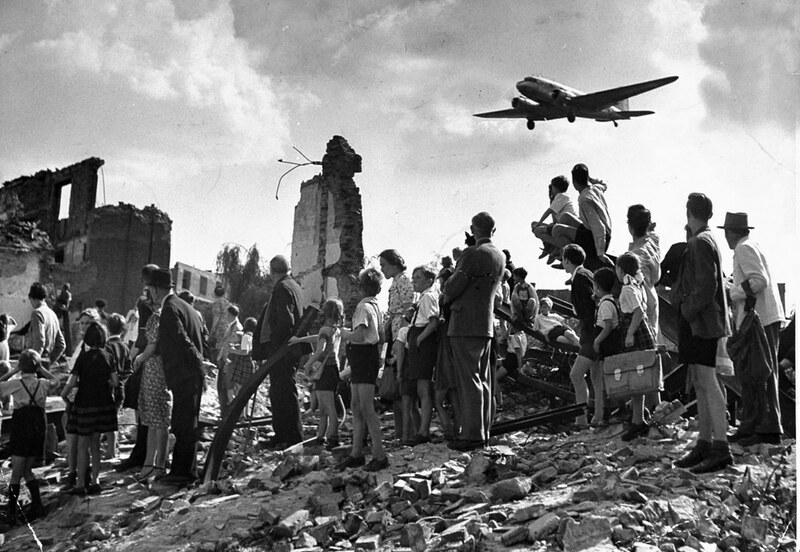 At the height of the Berlin Airlift, aircraft were landing every three minutes, supplying up to 13,000 tons of food, coal and medicine a day, according to the Air Force Historical Support Division. 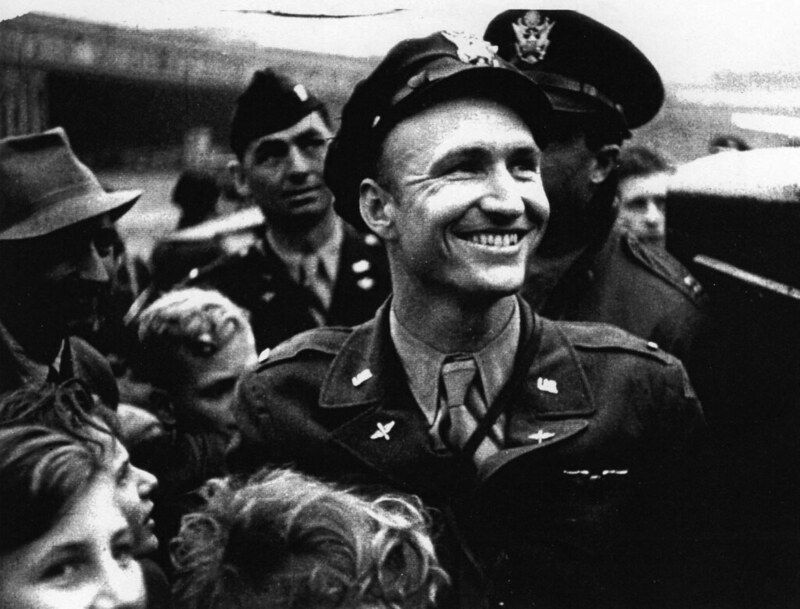 Then-1st Lt. Gail Halvorsen, who retired from the Air Force as a colonel in 1974, was one of the American pilots flying around-the-clock missions from Rhein-Main Air Base in West Germany to Tempelhof Air Field in Berlin. He flew 126 missions delivering supplies and food from July 1948 to February 1949. “We learned very clearly that the new enemy was Stalin. He was taking over where Hitler left off. We knew exactly what Stalin had in mind,” Halvorsen said. However, some Airmen had mixed emotions about aiding the former enemy that had been shooting at American pilots just three years before. Halvorsen admitting that he had issues at first with the mission, but it quickly changed when he talked with a fellow crewmember. “He told me that it is a hell of a lot better to feed them (rather) than kill them and that he was glad to be back. That is service before self. That is what causes your enemy to become your friend,” Halvorsen said. On one of his first missions, the American pilot learned in a conversation with German youth through the perimeter fence at Templehof, that West Berliners may have needed food, but they were even more hungry for hope and freedom. 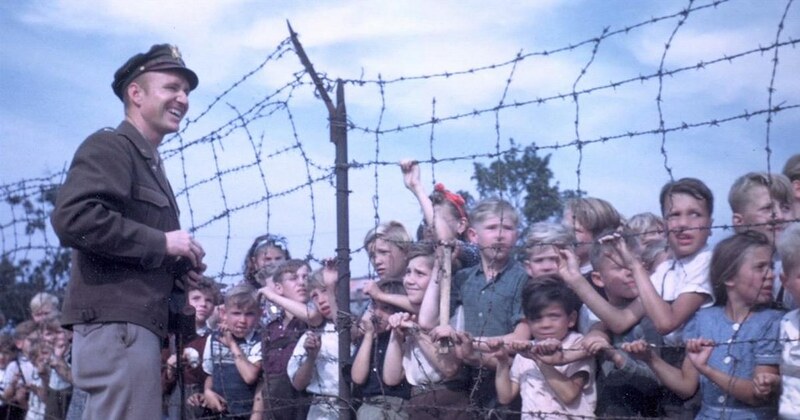 Lt. Gail Halvorsen, "The Candy Bomber," greets children of isolated West Berlin sometime during 1948-49 after dropping candy bars from the air on tiny parachutes. He greeted them with practically all the German he knew, but surprisingly, one of the group spoke English. Halvorsen was soon answering questions about how many sacks of flour and loaves of bread the airplanes carried and what other types of cargo were being airlifted. He talked with the children for an hour before he realized not one had asked him for anything. Instead, they gave him something he didn’t expect: the best lesson on freedom he’d ever heard. The contrast was so stark because during World War II, and dating all the way back to George Washington, if you were in an American uniform walking down the street, kids would chase you and ask for chocolate and gum. When he reached into his pocket for the two sticks of Wrigley’s Doublemint gum, Halvorsen debated the wisdom of giving it to them. Perhaps they’d fight over it. Yet, he broke each in half and passed four halves through the barbed wire, then braced for the rush of children to the fence. The children who didn’t get any of the gum only asked for a piece of the wrapper so they could smell the aroma. Their reaction, along with the surprise the pilot felt when they didn’t beg for anything, led to his decision to do more for them. The man the German children would later call “Onkel Wackelflugel” or Uncle Wiggly Wings, came up with an idea that would not only change the lives of those children, but would also help the West win the ideological war with the Soviets for Germany’s future. Halvorsen told the kids he would drop something to them on his next landing at Templehof if they promised to share. He would signal them on approach that it was his plane by wiggling the wings, something he’d done for his parents after he received his pilot’s license in 1941. Back at Rhein-Main Air Base, just 280 miles away, he combined his candy rations with those of his co-pilot and engineer, made parachutes out of handkerchiefs and string and tied them to chocolate and gum for the first “Operation Little Vittles” drop from his C-54 Skymaster July 18, 1948. 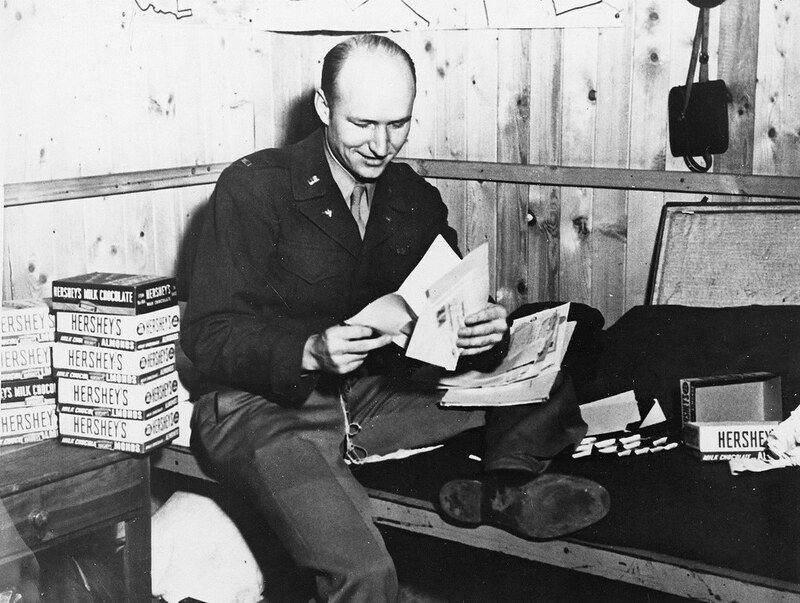 U.S. Air Force Lt. Gail Halvorsen, known as "The Candy Bomber", reads letters from grateful West Berlin children to whom he dropped candy bars on tiny parachutes during the Berlin Airlift. One day, after he returned from Berlin, Halvorsen was summoned by Col. James R. Haun, the C-54 squadron commander. Haun had received a call from Brig. Gen. William H. Tunner, deputy commander of operations during the airlift, who wanted to know who was dropping parachutes over Berlin. Halvorsen knew he was in trouble when Haun showed him the newspaper with the picture of little parachutes flying out of his C-54. “You got me in a little trouble there, Halvorsen,” Haun told him. Fellow pilots donated their candy rations. Eventually, they ran out of parachutes, so they made more from cloth and old shirt-sleeves until noncommissioned officers’ and officers’ wives at Rhein-Main AB began making them. Later, the American Confectioners Association donated 18 tons of candy, mostly sent through a Chicopee, Massachusetts school where students attached it to parachutes before sending to Berlin through then-Westover Air Force Base. By the end of the Berlin Airlift in September 1949, American pilots had dropped 250,000 parachutes and 23 tons of candy. 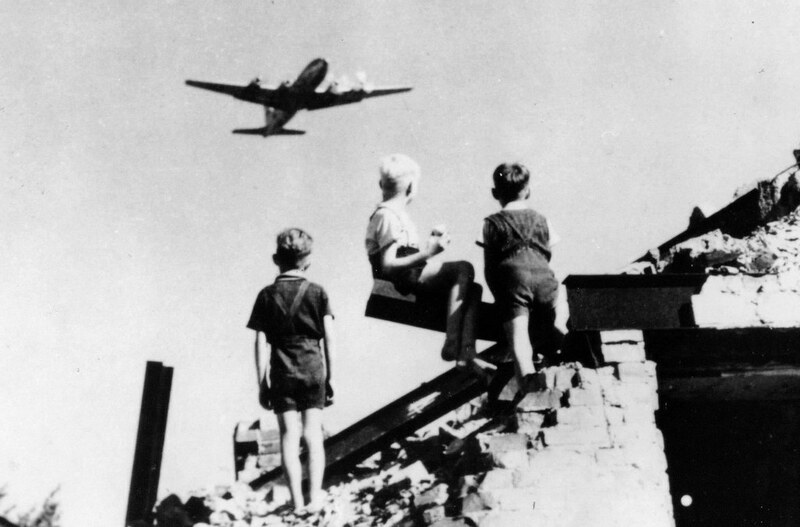 During the Berlin Airlift, then Lt. Gail S. Halvorsen dropped candy attached to parachutes made from handkerchiefs to German children watching the airlift operations from outside the fence of the Tempelhof Airport in West Berlin. One of those children was then seven-year-old Mercedes Simon whose father was killed during WWII. She and Halvorsen became pen pals and friends meeting many times later in life. The beginning of their friendship is recounted in the children's book, "Mercedes and the Chocolate Pilot" by Margot Theis Raven held by Halvorsen. One of them, a 7-year-old girl named Mercedes, wrote in a letter in 1948 that she loved “Der Schokoladen Flieger,” but was concerned for her chickens, who thought the airlift planes were chicken hawks. Mercedes asked him to drop candy near the white chickens because she didn’t care if he scared them. Halvorsen tried, but never could find Mercedes’ white chickens, so he wrote her a letter and sent her candy through the Berlin mail. The two would finally meet face-to-face 24 years later met when Halvorsen returned to Berlin as Templehof commander in the early 1970s. Mercedes’ husband, Peter Wild, convinced the Templehof commander to come to his home for dinner. Mercedes showed him the letter he’d written her in 1948, along with the chickens she’d written about in her own letter. 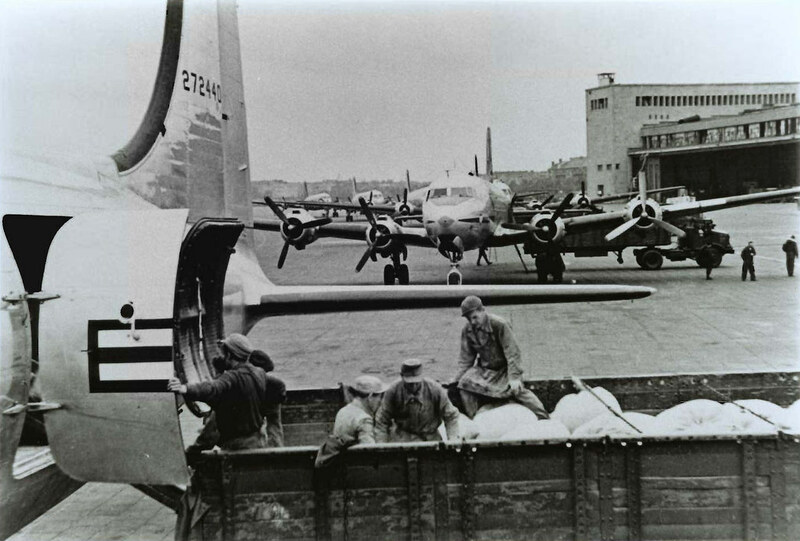 Crews unload planes at Tempelhof Airport during the Berlin Airlift. Halvorsen has returned to Berlin nearly 40 times since the airlift. In 1974, he received one of Germany’s highest medals, the Grosses Bundesverdienstkreuz, and carried the German team’s national placard into Rice-Eccles Stadium during the opening march for the 2002 Winter Olympics in Salt Lake City. 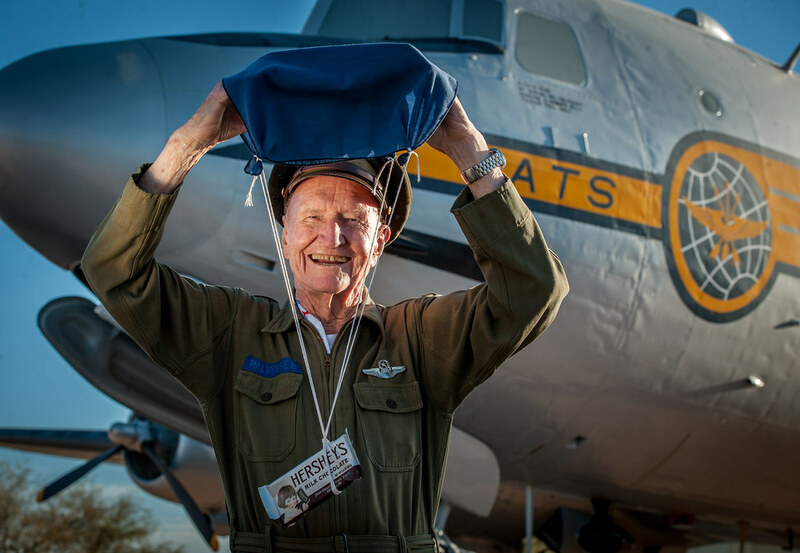 Halvorsen participated in a re-enactment of “Operation Little Vittles” during the 40th and 50th anniversaries of the Berlin Airlift and also dropped candy from a C-130 Hercules during Operation Provide Promise in Bosnia-Herzegovina. 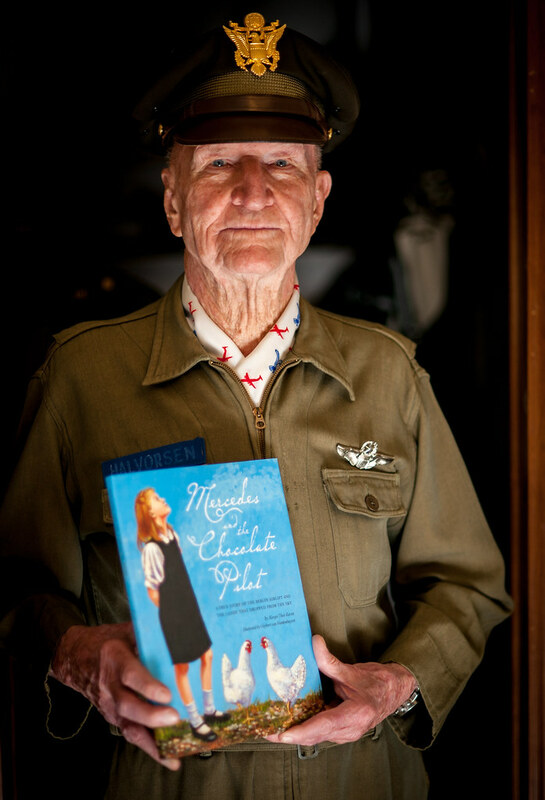 Even at the age of 97, Halvorsen keeps a busy schedule as he and his wife, Lorraine, split their time between their homes in Arizona and Utah. Several times a year he would fly the C-54 “Spirit of Freedom,” with FAA certification to fly second-in-command. He’s also visited many schools, both stateside and overseas, and visited Iraq to review Air Mobility Command transport operations and visit troops deployed in Southwest Asia. 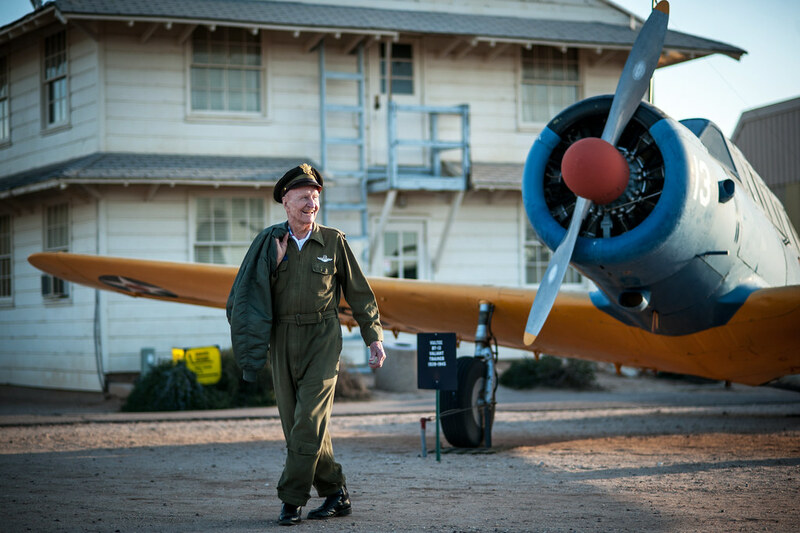 Seventy years since the Berlin Airlift, the colonel remains universally beloved as the “Candy Bomber,” but enjoys one thing about his perpetual notoriety the most. Halvorsen believes the praise he receives for bringing hope to a generation of Germans through his candy bombing deflects much of the credit to that first group of children at the barbed wire fence at Templehof. Their gratitude and thankfulness for the pilots’ efforts to keep them free during the Berlin Airlift inspired him to reach into his pocket for those two sticks of gum. That “smallest decision,” as Halvorsen calls it, led to 23 tons of candy dropped from the sky to the children of West Berlin and changed countless lives, not to mention the life of the Candy Bomber, himself. Halvorsen’s dedication to helping those in need didn’t end after he retired with 31 years of service in the Air Force. In 1994, his request to assist in another humanitarian airlift was approved. He would fly with the Air Force again, this time delivering food to 70,000 refugees fleeing from the conflict in Bosnia. “We have our freedom to choose, and when the freedom is taken away, air power is the only quick way to answer a crisis like that,” he recalled. 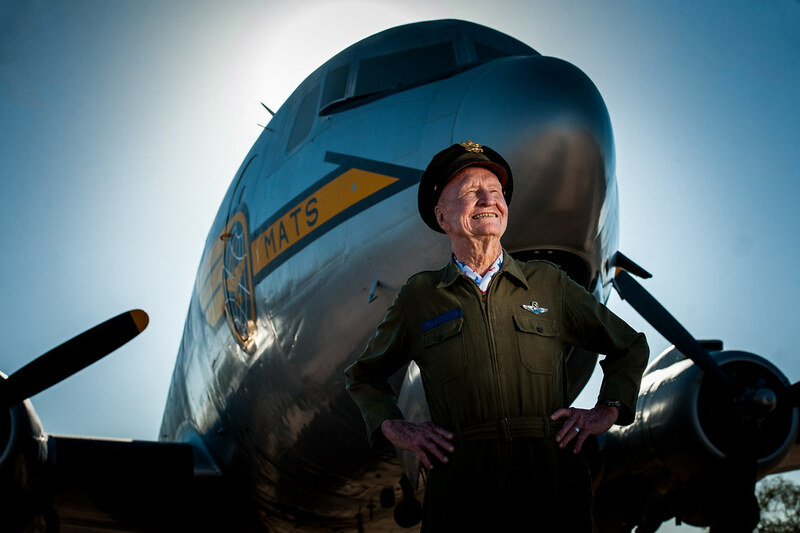 Retired U.S. Air Force Colonel Gail S. Halvorsen, known commonly as the "Berlin Candy Bomber" stands in front of C-54 Skymaster like the one he flew during WWII at the Pima Air and Space Museum in Arizona. 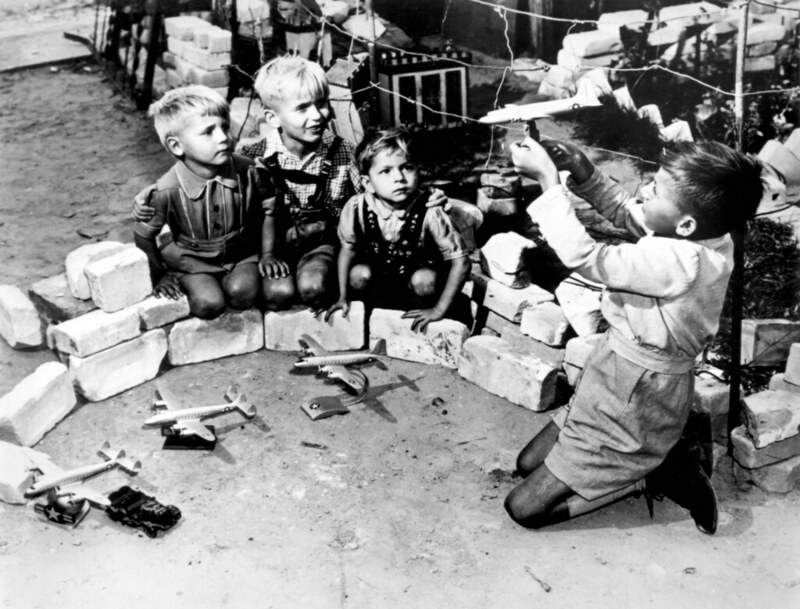 Halvorsen dropped candy bars attached to parachutes made from handkerchiefs to German children watching the airlift operations from outside the fence of the Tempelhof Airport in West Berlin. As word of his personal humanitarian mission spread to the United States donations of thousands of pounds of candy and hundreds of handkerchiefs and other pieces of scrap cloth reached him. By January 1949, more than 250,000 small parachutes with treats attached were dropped. For his actions Halvorsen received the 1948 Cheney Award "... for an act of valor, extreme fortitude, or self-sacrifice in a humanitarian interest." 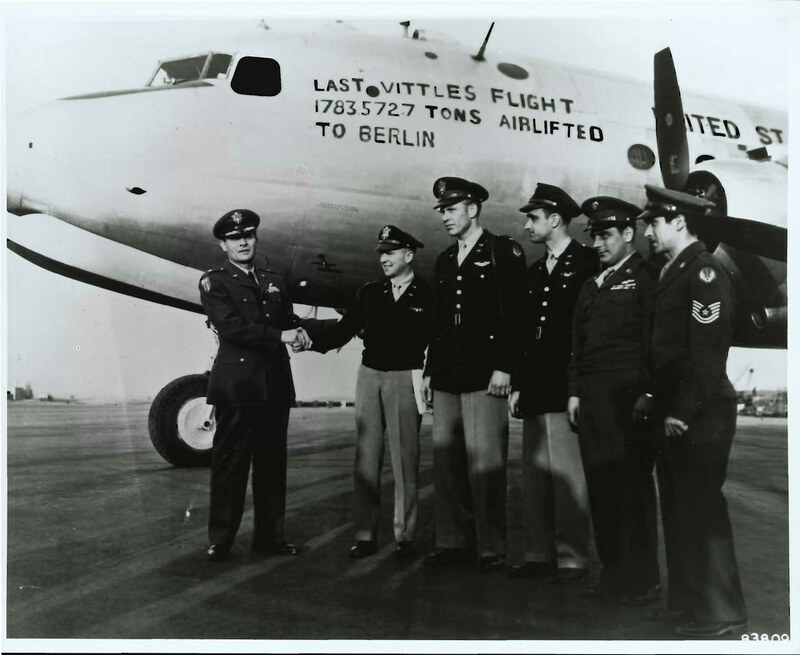  Archived in History, Operational, Uncategorized, Veterans and tagged airman magazine, AMC, Berlin Airlift, C-47, C-54, Candy Bomber, Cold War, Germany, MAC, Nazis, Operation Vittles, Soviet Union, usaf, World War II, WWII. Bookmark the permalink.